"Learn the Secrets of Making Money with Your Quilting Passion, Either Selling Your Own Quilts or Offering Quilting Services to Others... from the Internet's Leading Quilting Business Expert"
If you've ever thought about starting and running your own successful quilting business  while avoiding some of the most common mistakes made by business newbies  and using some of the most powerful marketing techniques available, then this might be the most important letter you'll ever read. "How do I sell the quilts that I make?" "Can I make money selling my quilts on eBay?" "Are custom quilting services in demand?" "Are t-shirt and photo quilts marketable?" "How can I get started in my own quilting business?" "How to Start Your Own Quilting Business"
How to Start Your Own Quilting Business is the definitive guide to showing you the ropes to starting, running, and marketing your own quilting business. I've packed as much information as I possibly can about making money with your quilting into a single, 150+ page quilting business "bible" that will show you the fastest way to get your quilting business off the ground. Look, I know you are passionate about your quilting, and want a way to take your hobby to the next level. Your friends and family tell you that your quilts are works of art and that you should sell them. They may have even offered to buy some of your quilts or quilted items from you. That's why you want to take the leap of faith and start your own quilting business selling your own quilts or offering custom quilting services to your local community (or even over the Internet!). For you, it's time to stop working for someone else, and start building a future that will replace your current income and allow you the freedom only true entrepreneurs enjoy. "7 Unique Ways to Make Money with Your Quilting." You'll receive 7 different - and unique - ways you can turn your quilting passion into a full or part-time income! YES! Enroll me in the mini-course. We respect your privacy. Your email address and name will never be sold, traded, or shared with anyone else. We hate SPAM more than anything! Maybe you've just started to explore the possibility of starting your own quilting business to see if you're ready for the commitment. Or perhaps you know you're ready, but want to be completely prepared when you start to put your quilting business together and getting the word out about your new business. This is the most comprehensive guide to starting your own quilting business available on the market today! Reason one: I am the author of the highly-successful quilting business books, "How to Start Your Own Machine Quilting Business" and "How to Start Your Own Quilt Shop." With over 2,431 copies sold since 2003, these are the leading resources for quilters looking to start their own machine quilting business or quilt shop. I am also the editor of the Quilting Business email list that currently has 5,513 subscribers, and more than 250 subscribers added each and every month - all of them looking to make money with their quilting passion. I also run the very popular quilting tips web site - www.QuiltersTips.com - home of the Weekly Quilting Tips Contest. Reason two: I have over 17 years of experience in marketing and business management. To me, there is nothing as important as being able to bring customers into your new business in the most effective, least expensive, manner. This book offers my expertise in the top marketing methods for a new quilting business, including Internet marketing and selling your quilts on eBay. Reason three: I've spent over a $1,000 and 100s of man hours (worth $1,000s more!) pulling together the most exhaustive, thorough guide to starting, running, and marketing a quilting business available anywhere. I've tried to leave no stone unturned when it comes to finding out the most effective information to lead your quilting business to success. You can take advantage of this investment at a fraction of the cost. General business books don't go into enough detail about the specifics of starting, running, and marketing a successful quilting business. This book delivers the step-by-step instructions you need to get your quilting business up and running in the least amount of time. Never run a business before? You don't have to worry about getting bogged down with over-complicated terms or unnecessary information. This book provides an easy-to-read primer to help guide you through some difficult concepts of starting a quilting business and running it effectively. Without customers, your quilting business will never take off and quickly die. That's why there's an entire section dedicated to marketing your quilting business. You'll see which advertising and promotional techniques will the most useful and effective methods of getting the word out about your new quilting business, and for attracting new - and repeat - customers. Starting any new business can be a bit intimidating, or even downright scary. "How to Start Your Own Quilting Business" takes you by the hand and lets you know everything that you'll need to do to start and run a successful quilting business. With all the right information, you can make a decision on whether or not a quilting business is right for you. One of the most exciting - and profitable - web sites on the Internet is eBay. With eBay, you now have access to tens of millions of potential customers. In fact, over 1.5 million people supplement their incomes by selling on eBay, and over 724,000 report that eBay is their primary or secondary source of income. eBay is big business and can be a great way to sell your quilts or quilted items. Craft fairs are one of the best markets for selling quilts and quilted items. Find out how to properly exhibit your quilts for maximum exposure - and maximum sales. Also, learn sneaky craft fair market research tricks to help you find out what items are selling for in your area - an aid when pricing your quilts. Discover some interesting facts about the quilting market, and how you can get involved in this $21 billion plus market. When you know who your customers are, it makes it easier to gear your new quilting business towards those most likely to purchase your wares. There's no way that any one book can give you every little bit of information you will need to run your quilting business long term. So, what I've done is provided some bonus resources that will give you more information about some key concepts, including time management, public relations, and finding suppliers. Running a business is not a walk in the park. In fact, it can be one of the most difficult things you'll ever do. But, with the right planning and attitude, you can take a lot of the "sting" out of the more mundane tasks, like record keeping, accounting, hiring, and more. How to Start Your Own Quilting Business was written with the business novice in mind. You know quilting and love your hobby. But, you may not know how to start and run a successful business. This book is designed to give you that knowledge and to help you decide if you want to make that leap from quilting hobby to full- or part-time quilting business. my other quality quilting business books. "Thanks for writting the How To book. It is the most realistic book I have read. You really hit the mark in the section on budgeting your money for marketing. This book has taught me alot. You speak in laymens terms and make everything understndable and interesting. I plan on keeping this book at my side at all times to help me continue on planning my business to be successful. Thanks again ." "This book is great, easy to read and understand. It guides you step by step through the process of starting up your own quilting business. With tips on how to avoid the pitfalls and make your business a success. I highly recommend this book to any one who is serious about turning their passion for quilting into a profitable business. " "I am finding this book extremely helpful in planning how I can sell the quilts I make. Although I have not decided on exactly what I will do, the book gives me several options from which to choose. Thanks so much, Chuck, for a very helpful tool. " I have been reading for days and I have to tell you, I am very impressed with your book "How To Start Your Own Quilting Business". I knew it would be a good read but it surpassed my wildest imagination with so much information. It is easy to understand and a good read. I also want to thank you for including the 101 Patchwork Patterns. I had the book but lost it in an accident five years ago. There is a large tulip pattern that I really love. In 1988, lived in Englewood, Colorado and purchased a used Dodge car. It was in bad need of seatcovers. I had little money so I decided to make the seat covers myself. The car was a reddish brown so I purchased some brown material, and some bright orange material and some bright green material. I made the seat covers and used that tulip design on the upper front of the seats and it was very pretty. Later when I sold the car, back to the person I had origionally purchased it from, his comment to me was "I will buy the car back but only if I can have the seat covers to". Needless to say, I was delighted to have that pattern back and will use it again and again, not necessairly for slipcovers. Just thought you would enjoy that little bit of information. Again I thank you for such a wonderful book and all the other resources that came with it. Keep up the great work. I look forward to your e mails. "How To Start Your Own Machine Quilting Business"
"This publication would be helpful to anyone new to starting a home-base business. There are many features that most people who haven't had a business before would not think to do in preparation for a new business. This publication is a great start in your decision making. Good luck everyone." "Chuck, this book is much better than the last one because it offers more ideas in marketing your business and more ideas in organization of the business. A job well done." "I think the book is full of useful information for anyone thinking about starting their own longarm quilting business, or another small business as far as that goes. The information regarding setting up a business plan and goals is extremely helpful! Also, Section 9, Keeping Records, is very good for those of us who have never had to keep track of expenses and income. Then Section 7 on Marking Your Business is also a good foundation to get you started in the right direction. Who and how to sell your services to is knowledge that most people don't have. All sections are extrememly helpful to any new small business person." "I found your book very informative and easy reading. You are able to explain things in a way that is understandable." "This is a very informative book and the only one of this kind. Highly recommended for those seriously considering a machine quilting business." "I haven't as yet opened my quilting business, but will soon. The "How to start your own Machine Quilting Business" book has been a valuable tool. I found valuable information in this book that I probably would have overlooked without it. The worksheets have been helpful and the listing of suggested suppliers are ready to be contacted for my materials. Thank you for writing these books. I plan to refer to them often even after I get to the point of being "open for business"." "I think the information is a good format for what might be expected. Very helpful with hints on shop name, location, how to borrow money.I think this a great book that will help the beginner or the first time business owner. I have thought about having my own quilt shop, but never knew how to go about getting started. This a great outline on the 'how-to's.' "
"How To Start Your Own Quilt Shop "
I want to thank you for putting out such a complete how to guide for a quilt shop. You start with the basic fundamentals, like business entity type, getting inventory purchased, merchandizing it so make it attractive right on through record keeping and marketing. It's very much a blueprint for my own quilt shop. It's also a great reference and I can see myself referring back to your book time and time again whenever challenges or opportunities arise. Thanks for your generous contribution to the independent quilt shop owners!" "I came across this website quite by accident - I was looking for information relating to "starting my own quilt shop" - I nearly fell off my chair when up popped information on your book "How to Start Your Own Quilt Shop". Every question I had asked myself was answered, and even questions I had not asked myself - I am very impressed with the amount of information you have in your publication that 'ordinary folk' require. I must also compliment you on the speed with which I received the hard copy of the book. As I live in a small country town in New South Wales, Australia, I still feel a little nervous about my dream of opening my own quilt shop - I will let you know if I do - to other quilters I say: "read 'How to Start Your Own Quilt Shop' and you have taken the first step towards realising your dream." "This is a great book. I wanted an on line quilt shop and this book came along at the right time for me. Very informative, lots of ideas. Anyone interested in their own quilt shop shhould purchase this book, it has helped me alot. Thank you !" "I have ordered "How to Start Your Own Quilt Shop" and have been very pleased with the information. My sister and I would like to open a Quilt Shop and have just started looking into details and information. In this book we have found very helpful information and it has given us a great starting point from basics on up. We are so excited to start this venture and this book has given us information that would have otherwise taken us a lot of time finding in various other places. With this book it is right there at our finger tips! Thanks so much Chuck." "I am considering opening a quilt shop your book answered all my questions. It covers everything from financing to inventory to location. Its a great resourse. Thanks for helping me make my decision." "It is a great source of information for anyone thinking about opening a quilt store. It is very thorough and certainly was a big help to me. My store should be open in 6 weeks and I couldn't have done it so quickly without your help. It's well worth every penny and a few more! I am very happy I made the decision to purchase this book. If the information wasn't in there, the source to get the information was. Excellent sources." Comprehensive Guide: If you are going to start a quilting business, you need to know how to name your business, register it, structure it, run it, and market it. How to Start Your Own Quilting Business gives you this basic business information geared towards your success. Information on Running Your Quilting Business: One of the things that can kill a business faster than a natural disaster is not knowing the ins and outs of running a successful business. How to Start Your Own Quilting Business provides insight on the ins and outs of running a successful quilting business. Marketing, Marketing, Marketing: Without a doubt, good marketing can help you create and maintain a successful quilting business. I have over 17 years of marketing experience, and this book offers the top methods to get the word out about your new quilting business and drive swarms of customers through your front door. How to Start Your Own Quilting Business is the result of over 100 hours of research and over $1,000 in consulting fees. When you purchase, you get a comprehensive guide to starting, opening, running, and marketing your quilting business. Other quilting business books on the market don't offer the depth of experience that has gone into How to Start Your Own Quilting Business . You receive the complete How to Start Your Own Quilting Businessguide with over 150 pages of information that will take you step-by-step through the process of starting your own successful quilting business. You get proven, tested advertising and marketing strategies geared towards quilting businesses. And you get a list of some of the most valuable resources for your new quilt shop. If you respond right away, you pay only $67 $37 for the electronic version (in Adobe Acrobat format - the most popular electronic document format on the Internet) of "How to Start Your Own Quilting Business." My customers and the professionals who have previewed this book tell me I could sell this information for at least $50 more, so who knows how long this price will last. A few years ago, I ran a site called www.AuctionRookie.com (which I've since sold). I created a short primer on how to start selling on eBay, which was a great way to learn how to get up and running on The World's Online Marketplace®. In addition, I've collected over 50 articles on eBay selling which are included. What I'm saying is don't decide now if this product is for you. Just get it and try it out. If it doesn't do everything I say and more, if you don't save money, time and frustration, if it isn't life-changing, if it doesn't work for you, you have nothing to worry about because you can get every dime of your money back under our no-loopholes guarantee. So you have nothing to lose and everything to gain. How to Start Your Own Quilting Business is available in Adobe Acrobat format (PDF), the most popular electronic format on the market. 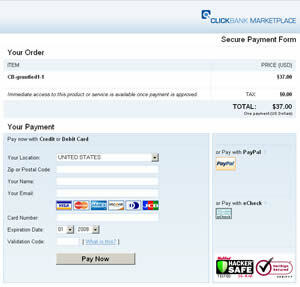 When you click on one of the order buttons, you will be taken to a Secure Ordering Page. You can use your credit card, PayPal, or electronic check to order online, which is the quickest way to get this powerful information into your hands. ELECTRONIC VERSION - $67 $37: The electronic version of How to Start Your Own Quilting Business is available for immediate download in Adobe Acrobat format. To access the PDF file, you will just need a copy of the FREE Adobe Acrobat Reader software. To order the electronic version, please click here or on the Electronic button below. P.S.My customers and friends tell me I'm crazy to offer so much for so little. I have piled on the bonuses (worth $189), and over-delivered on the content of this book. I am testing How to Start Your Own Quilting Business at this price with this bonus package for a limited time. Order now to make sure you get your copy! P.S.S. I'm currently testing the price of the book at the reduced rates (save $30 on any of the versions!). I don't know how long this price test will last, so please order right now! PLEASE NOTE: Your credit card statement will show a charge from ClickBank or CLK*BANK.COM. ©2006-2011 Gryphon Publishing Inc. All Rights Reserved. By entering, you agree to terms and conditions found here. By entering your email address you are also requesting and agreeing to subscribe to our free Quilting Business email newsletter. You must be 18 or older to enter. Check out our Free QuiltingBusiness Blog here.